French author, born in Paris on the 12th of January 1628. 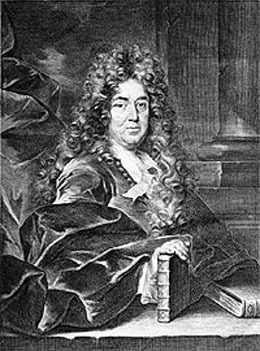 His father, Pierre Perrault, was a barrister, all of whose four sons were men of some distinction: Claude (1613-1688), the second, was by profession a physician, but became the architect of the Louvre, and translated Vitruvius (1673). Charles was brought up at the Collège de Beauvais, until he chose to quarrel with his masters, after which he was allowed to follow his own bent in the way of study. He took his degree of licencié en droit at Orleans in 1651, and was almost immediately called to the Paris bar, where, however, he practiced for a very short time. In 1654 his brother became receiver-general of Paris, and made Charles his clerk. After nearly ten years of this employment he was, in 1663, chosen by Colbert as his secretary to assist and advise him in matters relating to the arts and sciences, not forgetting literature. He was controller-general of the department of public works, member of the commission that afterwards developed into the Académie des Inscriptions, and in 1671 he was admitted to the Académie Française. Perrault justified his election in several ways. One was the orderly arrangement of the business affairs of the Academy, another was the suggestion of the custom of holding public séances for the reception of candidates. Colbert's death in 1683 put an end to Perrault's official career, and he then gave himself up to literature, beginning with Saint Paulin évêque de Nole, avec une épître chrétienne sur la pénitence, et une ode aux nouveaux convertis. The famous dispute of the ancients and moderns arose from a poem on the Siècle de Louis le Grand (1687), read before the Academy by Perrault, on which Nicolas Boileau commented in violent terms. Perrault had ideas and a will of his own, and he published (4 vols., 1688-96) his Parallèle des anciens et des modernes. The controversy that followed in its train raged hotly in France, passed from there to England, and in the days of Antoine Houdart de la Motte and Fénelon broke out again in the country of its origin. As far as Perrault is concerned he was inferior to his adversaries in learning, but decidedly superior to them in wit and politeness. It is not known what drew Perrault to the composition of the only works of his which are still read, but the taste for fairy stories and Oriental tales at court is noticed by Mme. de Sevigné in 1676, and at the end of the 17th century gave rise to the fairy stories of Mlle. L'Heritier de Villaudon, whose Bigarrures ingénieuses appeared in 1696, of Mme. d'Aulnoy and others, while Antoine Galland's translation of the Thousand and One Nights belongs to the early years of the 18th century. The first of Perrault's contes, Grisélidis, which is in verse, appeared in 1691, and was reprinted with Peau d'âne and Les Souhaits ridicules, also in verse, in a Recueil de pièces curieuses -- published at The Hague in 1694. But Perrault was no poet, and the merit of these pieces is entirely obscured by that of the prose tales, La Belle au bois dormant, Petit chaperon rouge, La Barbe bleue, Le Chat botté, Les Fées, Cendrillon, Riquet à la houppe and Le Petit poucet, which appeared in a volume with 1697 on the title page, and with the general title of Histoires ou contes du temps passé avec des moralités. The frontispiece contained a placard with the inscription, "Contes de ma mère l'oie" ("Tales of Mother Goose"). In 1876 Paul Lacroix attributed the stories to the authorship of Perrault's son, P. Darmancour, who signed the dedication, and was then, according to Lacroix, nineteen years old. Andrew Lang has suggested that the son was a child, not a young man of nineteen, that he really wrote down the stories as he heard them, and that they were then edited by his father. This supposition would explain the mixture of naïveté and satire in the text. Perrault's other works include his Mémoires (in which he was assisted by his brother Claude), giving much valuable information on Colbert's ministry; an Enéide travestie written in collaboration with his two brothers, and Les Hommes illustres qui ont paru en France pendant ce siècle (2 vols., 1696-1700). He died on the 16th of May 1703, in Paris. His son, Perrault d'Arma-Court, was the author of a well-known book, Contes des fées, containing the story of Cinderella, etc.